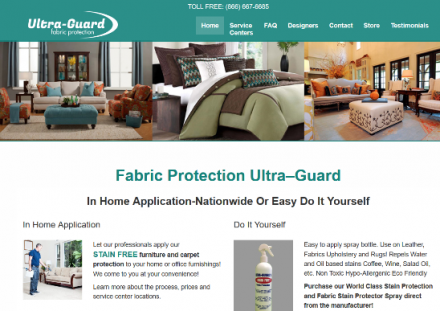 Ultra-Guard is the Interior Designers Choice in Fabric Protection, and furniture protection, offering the only on-site nanotech stain guard for upholstery and carpet. The Ultra-Guard formula called STAIN FREE contains an ultra-violet inhibitor to reduce sun fade on furniture and rugs. STAIN FREE, unlike temporary Scotchgard type applications, does not contain silicone and will not change the color or feel of fabric and is guaranteed for the life of the fabric. STAIN FREE is non-toxic, hypo-allergenic, and safe for kids and pets. Ultra-Guard has been in the furniture protection business since 1987 and currently has over 200 service centers. Description: Professional fabric and furniture stain protection spray from Ultra Guard including sun and UV protection. Stain remover spray for upholstery, carpet, curtains, leather and suede. Polyaire Online Store (Popularity: ): Polyaire is Australia’s largest manufacturer and distributor of air conditioning products and operates over 25 warehouses nationwide.